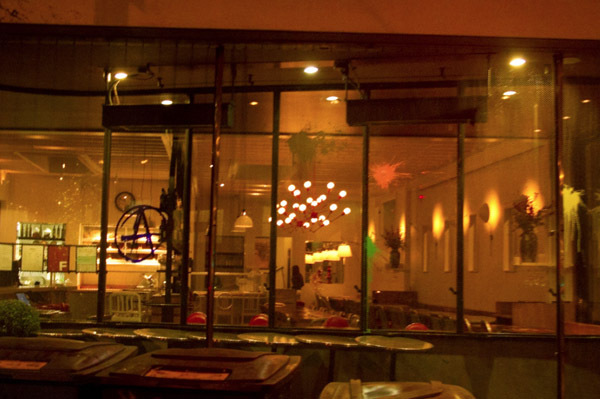 The company that previously owned Farina, the Italian restaurant with locations on Valencia and 18th streets, owes hundreds of thousands of dollars in wages, parking taxes and unpaid invoices, according to court documents. Attempts by the city and sheriff’s office to recover the money have repeatedly failed, according to lawyers representing the employees and the sheriff’s department. The former employees’ attorneys say the restaurant’s owners are engaging in evasive tactics to avoid paying their debts. Others say California’s laws governing limited liability corporations make it difficult to collect judgments. Gabriele Modica, a manager at the 18th Street restaurant, said the judgments have nothing to do with Farina’s current owner Global Trading & Marketing. Modica said Global Trading acquired Farina in late 2014. A record with the California Secretary of State indicates the company filed in January 2015. Modica called the judgements a “misunderstanding” stemming from the restaurant’s purchase by Global Trading & Marketing. It is unclear, however, who owns Global Trading & Marketing and requests to talk to any of the owners were ignored. Modica could not confirm, however, that none of the operators of the new LLC were ever part of the previous LLC. Luca Minna, one of the owners listed in some of the suits and judgments against Farina Focaccia & Cucina Italiana, did not respond to repeated requests for comment. Court records show some 30 former employees have received judgments by the state’s labor board requiring the business to pay them wages, tips, interest and penalties ranging from $860 to more than $22,000. Court records indicate that Farina paid some $63,000 in judgments against it in 2013 and 2014, but many are still outstanding. In desperation, one former employee has taken to the streets. 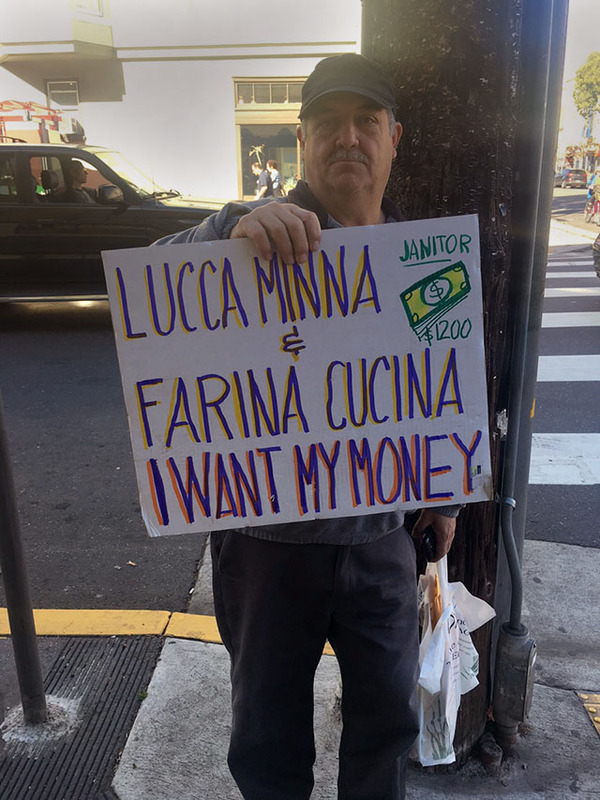 Gustavo Palma, a Guatemalan immigrant, spent several days recently to stand in front of Farina’s Pizzeria on Valencia Street with a sign alleging the restaurant owes him $1,200. Gustavo Palma outside Farina Pizzeria on Valencia and 18th. Palma said he got a job cleaning the restaurant and its offices in early 2015. He said he was paid in cash for four months, and then suddenly the payments stopped. He kept working at both restaurants for another six months. When his mother died, he said, he was unable to return home or contribute to the funeral and he started to begin protesting, hoping the owners would pay up. That hasn’t happened. He says he is homeless, and living in a shelter. A manager at Farina’s 18th Street location said Palma never worked directly for the restaurants, but was hired through a contracting firm. Palma has since filed suit, though no judgment has been issued in his case. Palma’s case is the most recent in a string of claims against Farina Focaccia & Cucina Italiana LLC and various similar permutations of that name. Many of them have had courts rule in their favor, but in many cases years have passed without any indication that the debts were paid. Sandra Valmana began working at Farina Pizzeria in December 2013, having just left another restaurant job where pay was unreliable. She said she was warned by the hiring manager during her interview that Farina was sometimes a bit late with checks. “I thought, ‘It can’t be worse than what I’m leaving right now.’ And it was,” Valmana said. The waitress, now an interpreter, said she was often paid two months late, and had to plead with management to get them to write her checks. Four of the paychecks she received over her tenure at Farina, from December 2013 to July 2014, were written without sufficient funds – once, she paid her tuition for her interpreting program at San Francisco State University only to be hit with overdraft fees because the paycheck she had been relying on had bounced. Valmana made several attempts to get paid or leave. She said she was asked to stick it out, just a little longer – first at the pizzeria, then at the restaurant on 18th Street. Things did not improve. Now, she has two judgments in her favor, saying the business owes her more than $40,000 total. Employees are not the only ones filing lawsuits. Other businesses, too, have alleged that Farina’s former LLC owes them money. Since 2012, seven businesses have received judgments awarding them between $5,000 and $30,000 for unpaid invoices. The City and County of San Francisco says Farina – both the former LLC and the new one – owes it more than $30,000 in parking taxes, according to court documents. Other court cases have been filed by companies owed money for food supplies as well as months of advertising in a local tourist guide magazine. In total, the judgments that appear to have gone unpaid add up to more than $335,000. Four of them stem from conflicts that arose in 2015. Sheriff’s Department Chief of Staff Eileen Hirst said the department has been tasked with collecting money from Farina on several occasions, either by levying funds from a bank account associated with the business or by placing a “keeper” at the restaurant’s register for a day to levy funds as they come in. “In this case neither one of those methods has proved to be enough to pay off all of the plaintiffs. The funds collected were simply insufficient,” Hirst said. “Earlier in this large volume of cases people were more successful in collecting money than they are later…If there’s no money to collect and no business coming in then the judgment will not be satisfied,” she added. Emily Thiagaraj, one of the lawyers representing two former Farina employees who have had judgments issued in their favor has been frustrated in trying to collect on the judgments. One thing that has prevented the city from seizing the funds and compensating those Farina shorted is that the business now operates with a different name on paper. Court documents forcing a business to hand over money must name the business exactly, so a name change hampers the collection process. Greg Groeneveld, a collections attorney, said collecting can also become difficult when a company named in court paperwork doesn’t have a bank account to collect from. What’s more, a corporation is a separate person from the owners – making it difficult to hold the people behind an LLC accountable. Thiagaraj said her office has gone to the District Attorney’s office for help, as well as the sheriff’s department. “Neither of those avenues have been successful so far,” she said. Josue Arguelles, who works with several former Farina employees through Young Workers United, said nailing down just who is responsible for the payments is one of the biggest challenges in the case. Arguelles said one of the apparent owners of the previous LLC, Luca Minna, did make some appearances in case management conferences. “It’s some of the worst I’ve seen anywhere in the country,” he said. Meanwhile, a former employee who wished to remain anonymous said current lower-level employees are still getting shorted on their wages under new management. This could not be independently confirmed, though three of the judgments against the restaurant indicate that employees were owed wages and tips for time worked in 2015, after the change in management. Hmmm… Farina restaurants have been slimeballs from the get-go. I’ve boycotted both farina restaurants since they opened because of the dirty moves they pulled and the way they treated their soon-to-be neighbors. Sadly, boycotting doesn’t do much, but this article gave me a new idea: There IS such a thing as a free lunch! I think I’ll eat there today, maybe have a glass of the most expensive wine, too, and when the bill comes, I simply won’t pay it. Don’t worry, I’ll leave an extra large tip for the staff before I walk out… Seems fair, right? Anyone want to join? C’mon… Lunch is on Farina, today and everyday. Dinner, too! Joe – Many restaurants make the waiter/waitress pay the tab when a customer stiffs them (does not pay). Whether Farina does this or not I do not know. But, based on the company’s alleged financial improprieties, I personally would not risk it. Why make a bad situation worse for their employees? No they dont. Ive been in industry along time, if anyone pulled that. the manager would do a full comp. server would never pay. where are you from Farina? My hope is that the workers are paid their wages and soon too! Thanks for this accountability story and shining a light on corrupt Mission business folks. I was wondering why the employees don’t just take the nightly till. It seems to me that would be the most efficient way to collect money. I doubt that many diners pay cash. The Sangiacomo Family invested in Farina. No wonder there are shady allegations. I have always regarded these two places as “Chump Stumps”. Places where cool fools go to spend way too much money for what amounts to presented fast food. No longer do I have to bother with explanations as to why I won’t go when invited there. this restaurant owed me 7,000 dollar lucca mina is a traitor!!!!! this place destroy my life!!! The previous restaurant job of Sandra always payed on time. I am the owner and I can confront Sandra if needed.